One can see implementation of radical intellectual property laws in many countries, which makes check paper for plagiarism an essential element in modern educational system. Teachers are well-aware of all students’ tricks, who tend to reproduce ideas of others and forget about referencing. Without proper crediting to the source, one can be blamed for plagiarism and breaking intellectual property laws. If you want to avoid such situations in your student life, you should know how to check paper for plagiarism before submission. Many students try to find free plagiarism checkers that compare a student’s text with the content on many websites. Students should rely on plagiarism check in their academic writing as much as they work with the paper instructions. Submitting a plagiarism-free paper is as important as checking if all instructions were followed in the paper. If you ask yourself “how to check my paper for plagiarism,” it means that you understand all the consequences of academic cheating that is treated as “crime” by educators. Students have to work on too many assignments simultaneously and they might forget to put quotation marks around a direct quote or paraphrase some sentences to make them plagiarism-free. However, good solutions always exist. You can check essay for plagiarism for free on our website. Many students make the same mistakes. They do not understand that plagiarism check remains an essential part of educational system. Your teacher may not even read an essay if a college scanner detects some similarities with other students’ papers or online content. Therefore, if you want to submit a well-written paper with genuine content, you can use our free online plagiarism checker and we will be pleased to help you get the highest grade. Our free plagiarism check is accessible online 24/7/365. We have a free trial option, which allows checking your text for free (up to 300 words on a daily basis). It is extremely easy to scan a paper. You will only have to copy-paste the text into a window and click “Check Your Text.” It may take several minutes to scan your paper because it compares the text with billions of web pages (online resources, databases, blogs, etc.). Once plagiarism check is done, you will see the results on the screen and can also download a free plagiarism report for further usage. If you want to suppress your anxiety before submitting a paper and want to be positive that your paper is plagiarism-free, it means that you realize the outcomes of academic dishonesty. Definitely not all students are fortunate enough to be allowed to resubmit the assignment. In most cases, they fail the whole course or might be even be expelled from the educational establishment. You surely do not want to face the same issues, do you? We offer credible checking for plagiarism and give students a possibility to forget about academic worries relating to plagiarism. If you have chosen a plagiarism checker, find out if you will get a plagiarism report to deal with. It is essential to know which parts should be rewritten. Moreover, do not forget that every paper should be scanned for plagiarism, no matter what course you attend. You may forget to quote some parts or simply consider some sentences as “common knowledge,” but they should also be cited. Plagiarism check should become your regular habit before submission of all home assignments. Check the word count limits. 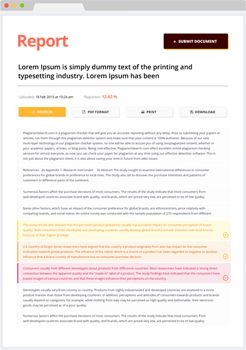 Plagiarism detection tools usually allow scanning a certain amount of words. Therefore, if your text is longer, a part of your paper will be left unchecked. However, you can always find the pricing options available on the website to scan as many documents as needed, no matter how lengthy they are.